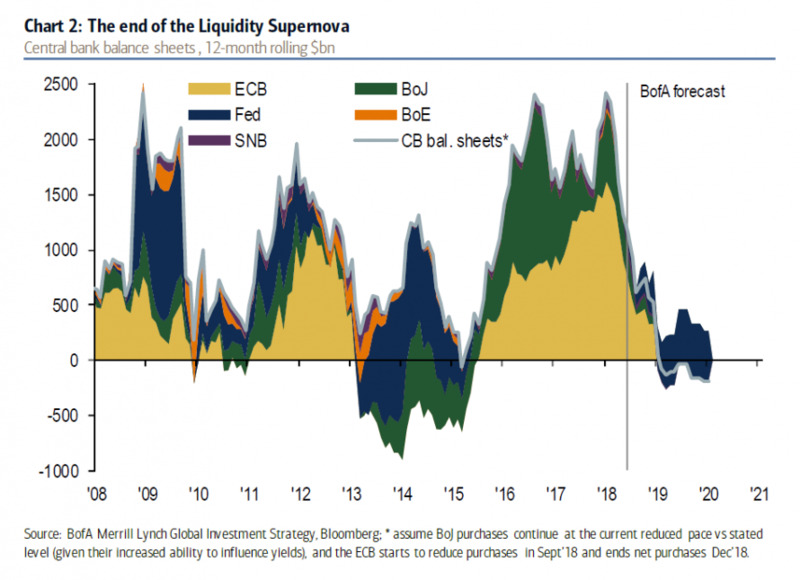 According to most flow-tracking economists (and not their conventionally-trained peers) when one strips away the noise, there are just two things that matter for the highly financialized global economy and asset prices: central bank liquidity injections, and Chinese credit creation. 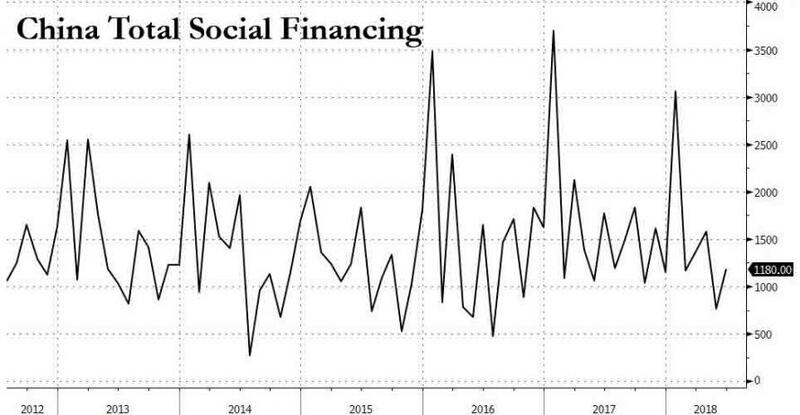 ... the latest Chinese credit creation data released overnight, added significantly to the risk of a "sudden global economic stop" after the PBOC reported that in June, China's broadest monetary aggregate, Total Social Financing, barely rebounded from May's 2 year low, rising to RMB1.138TN - missing expectations of a 1.4TN print, and confirming that Beijing's shadow deleveraging campaign is accelerating and gaining even more traction, even if the threat of a global deflationary spillover is rising by the day. 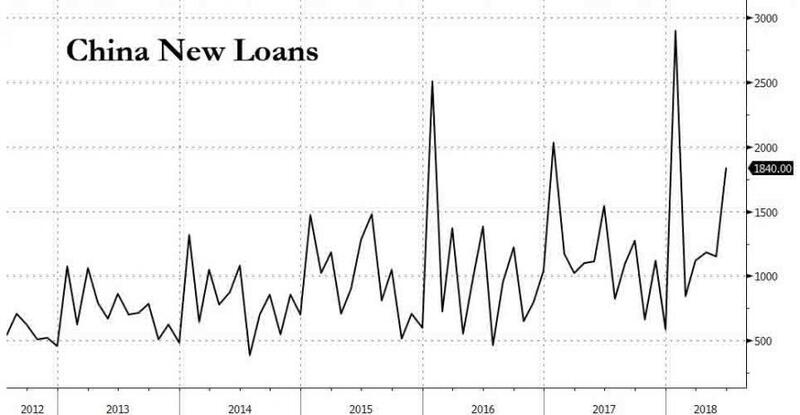 And yet even despite the 4th highest monthly increase in total new loans, Total Social Financing was still a disappointment, and for the second month in a row, was below the new loans print. Meanwhile, the lass granular M2 reading also posted a growth slowdown, rising only 8.0% in June, down from May's 8.3%, below consensus of 8.4%, and the lowest on record. Commenting on the ongoing slowdown in China's credit creation, Goldman said that the latest money and credit data highlighted the challenges the government is facing in loosening monetary policy. 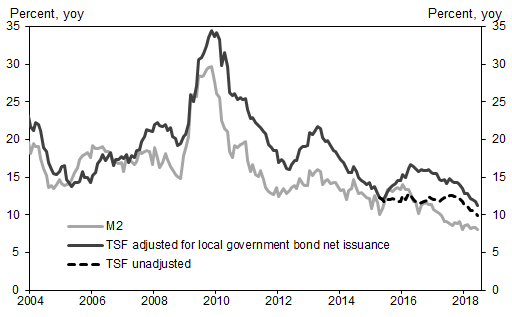 Specifically, while the loosening policy intention should be clear judging from the RMB lending rebound and more net fiscal spending (June fiscal expenditure accelerated to around 7%yoy from 0.5%yoy in May), the effectiveness of the policy loosening is clearly questionable. 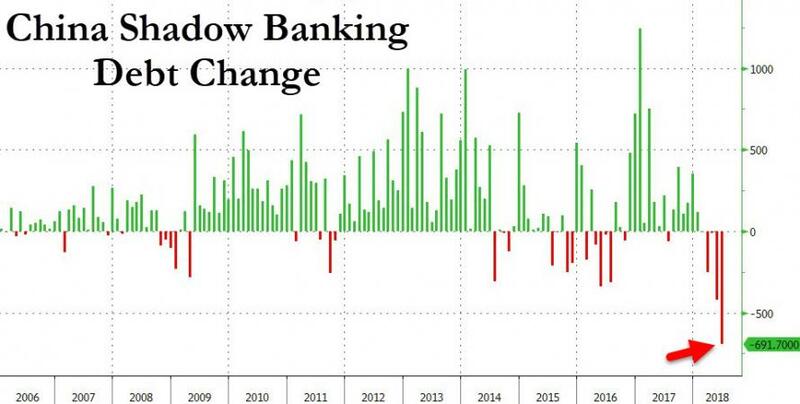 Meanwhile, commenting on the drag of non-loan TSF - which as noted above became even bigger than it was in May - Goldman said it was "clearly not the recent policy intention but a reflection of the earlier regulations on shadow banking activities." Here Goldman notes something curious: in recent weeks there has been a lack of emphasis on deleveraging in officials’ comments. Whenever the word leverage is mentioned, the “de-“ prefix has been substituted by the word “stabilizing” or “controlling”. The news on the delayed release of detailed wealth management product rules by the banking regulator is another indirect indication of the policy bias to treat this issue flexibly, especially when the trade war is on. And while that does not mean the government is taking an U turn on this and allowing shadow bank activities to bounce back to old levels, the large falls like what we saw in May and June is not what they want to see either, at last not until the trade dispute is resolved. "The difficulty the government faces is how to fine tune the behavior of financial institutions", according to Goldman. window guide the behavior of financial institutions so the non-loan TSF activities at least become less of a drag. how the trade war proceeds, which is not fully in China’s control and the 200 billion USD in additional proposed tariffs was likely a surprise judging from its reaction. And while all these are all possible next steps by Beijing, what Goldman forgot to note is that with the Yuan more or less pegged to the dollar, as the Fed keeps hiking rates, Beijing will find itself on the bad end of an interest-rate differential, resulting in further Yuan declines, which - as recent history is a guide - can quickly mutate into a powerful capital flight, forcing Beijing to dump reserves to stabilize the currency, or alternatively, end the shadow easing process and hike rates. But China's economy aside, the bigger question remains how long until the market realizes that between central banks and China, there is virtually no new credit - and liquidity - creation. Judging by today's push in the S&P500 above 2,800 it wont be today.